And that’s pretty much how it all happened. No drama, at least none of the bad kind. I thankfully got “the third flat” during a long ride in the weeks prior to the race. For those that aren’t cyclists, there is an old cycling lore that flats come in threes, and with two during the previous two races, the superstitious side of me was sort of praying for a flat during training. Of course, I wasn’t really that thankful when it actually happened during a ride that of course was into a wind that shifted during the ride in order to remain a constant headwind. But that training ride was probably the most dramatic event between the very unfortunate day in Boise and the very fortunate day in Vancouver. In fact, things went so well it’s sort of hard to write about anything. Even the weather cooperated; it was calm and sunny and pretty much perfect. And it set me up for a pretty much perfect race. And, then, as if out of a storybook, the weather turned not long after I finished the race, with clouds and cool weather rolling in, just opposite of what happened in Boise. 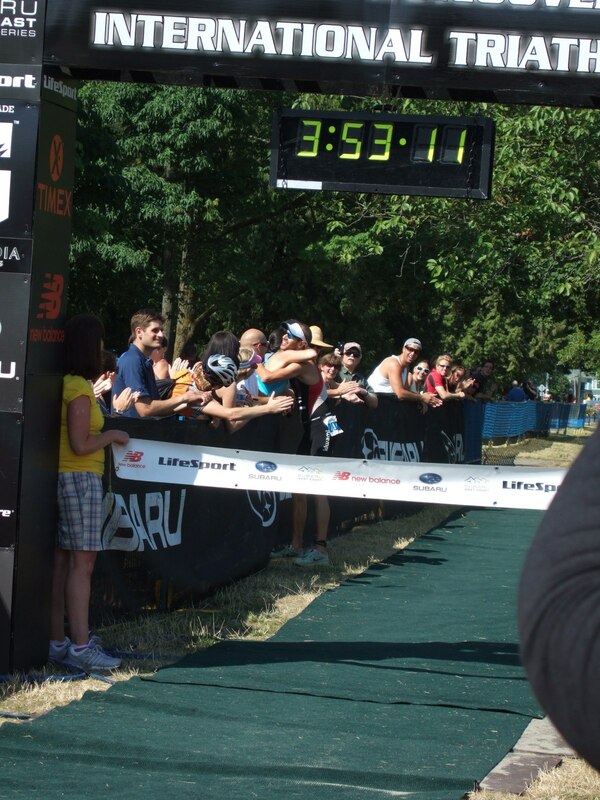 In reality, it was exactly the same thing, weatherwise, but the start time in Boise meant the race started with bad weather whereas the race in Vancouver ended with it, though it wasn’t really “bad,” just worse than what we had to race in. And that’s pretty much how everything else went. It was the opposite of Boise. Out near the lead group, into the lead on the ride, and a best performance ever in a half-ironman run to finish it off with a best ever time for the distance. And, of course, the single most important thing that was missing in both Connecticut and Idaho? Jill was there at the finish. ← Give A Little. Get A Lot. Please tell me you're going to write a “real” rr? Come on. Yours are the BEST! It was great to watch you out there absolutely dominate and finally be able to cheer for you in person. Awesome race!